How much Power Should a Garage Fan Have? What size should it be? Pointers to Getting the Best Garage Fans? If you’ve been sweating through your clothes this summer every time you work in the garage, it may be about time to consider a garage fan. By installing a fan in the garage, you can negate the thick insulation and lack of ventilation by circulating the air. It cuts back on that sticky, muggy feeling and gives you a more comfortable environment to work in. Take a look at our guide to help you think about the choices you have when it comes to garage fans. If you’re a person who works out in the garage or uses the garage space as a workshop, you may find yourself losing your cool in the summer. Garages can get a little hot, leading you to need a garage fan. If your garage is west-facing, you’ll often find that you’re experiencing the late afternoon intense sun blazing down. This is exacerbated if your garage door has a dark color, absorbing the heat into the room. If your garage is specially insulated, you may find it feels a little greenhouse effect, locking the heat in your garage. While great for the winter, it can be unbearable if you work in the garage in the summer. Without a ventilation system installed or the continuous use of a dehumidifier, you might find your garage becomes a little ‘muggy’ as the humidity builds up. By installing a garage fan, you’ll find that you can move the air, creating a more fresh feel to the room. The space of the room you are trying to cool will determine the amount of power you will need. 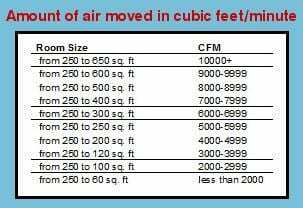 When purchasing a fan, look for the ‘cfm’ or cubic feet per minute measurement. Garages are relatively large regarding room space and often have draughty corners and cracks. With this in mind, you’ll need something high powered. Models of around 3000 CFM and above are designed specifically to cope with the demand needed in a garage. Far more industrial in power usage, garage fans tend to be a lot more powerful than the average indoor house fan. With that in mind, always measure your space to look for a device designed to cope with your size garage. So that you increase efficiency. Keep an eye out for these qualities when selecting a garage fan. Some garage fans come with variable speeds. This allows you to control the temperature more effectively in your garage. While this can help to bring more comfort, fast speeds tend to be louder. Some people don’t mind the whirring of a fan, but it can be distracting especially since garage fans need to be efficacious. Therefore tending to be louder than house fans. However, look for the ‘sones’ rating to show how loud it is with 0.3 being relatively quiet, and 4.0 being far louder. The length of the power cord is essential to consider if you have limited space or awkward power socket placement. While you can use an extension cord, it is always safer to plug the fan into the wall. Garage fans come with varying adjustment mechanisms for you to change the air direction when necessary. While some models oscillate, others can be pointed in certain directions. A few garage fans have height adjustment mechanisms too. Check the warranty details to inspect reliability and durability. If the company is offering a lengthy warranty, they have confidence in the product. Shorter warranties or those with many conditions tend to accompany lower quality devices. You need to look for a model that complements your budget. Consider all the above conditions and then search in your price bracket for something that checks as many boxes as possible. With that in mind, also take into account the efficiency level. While higher efficiency fans are more expensive upfront, they tend to lower running costs. If you’re in the market for a garage fan, here is a little insight into what’s out there. With advantages and disadvantages of garage fans outlined, our guide runs you through what to look for and where to find it! 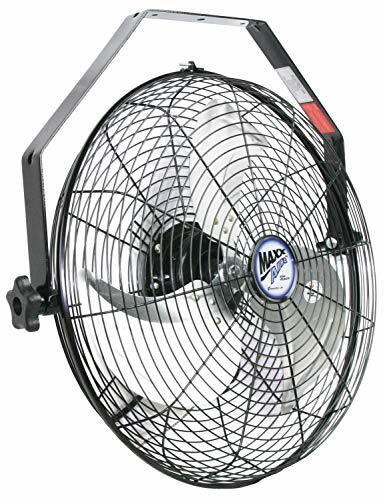 Easily converted from a floor mount to a wall mount, this versatile fan has a carry handle and three powerful speeds. It is designed for garage use and made with industrial grade materials. It stands at 20 inches tall. The handle makes it easy to move around the garage. This model is extremely durable and lasts a long time. The three speeds allow for more comfortable operation. It has versatile mounting, allowing wall-mounting to save space or floor mounting for portability. This model is quite noisy. The blades are made of thin aluminum which can bend easily if dropped. 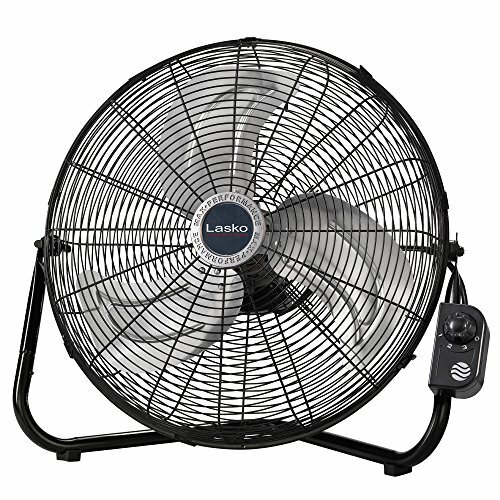 A powerful garage fan, this model has versatile mounting and can easily cope with cooling large spaces. Be careful not to drop it while installing. The blades are a little fragile. But enjoy the ease of moving it around by its carry handle. 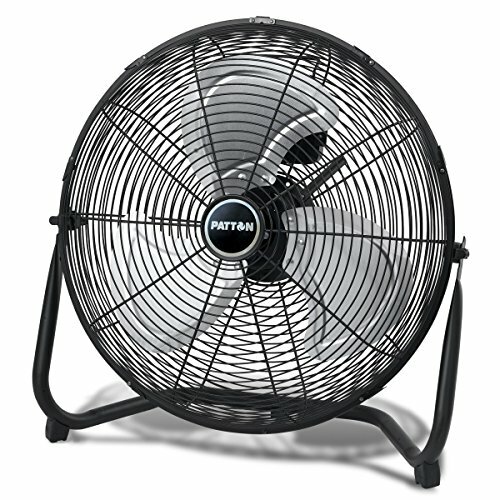 With 18 inch blades, this large fan has a powerful motor and three speeds for quick cooling of large spaces. It has a tiltable head. And is designed of durable metals to withstand workshop environments. The carry handle makes it easy to transport. 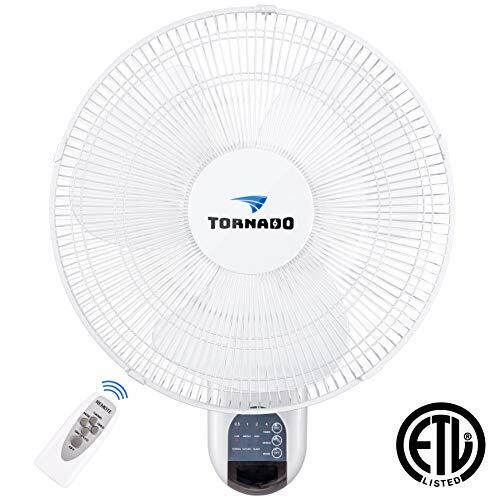 The powerful motor and large blades make it a very effective fan. The adjustable head allows the user to focus cool air in the right direction. Engineered from durable materials, it is a hardy garage fan suitable for construction environments. It is quite expensive for a garage fan. It is significantly loud, even when on the lowest setting. While a little pricey, this model is a powerful choice for large garages. It can be pointed easily to where cooling is needed and can be moved around with ease. It is a little loud, however. This garage fan can be wall-mounted or can be installed as a hanging fan. It can tilt 180 degrees, and the three speeds are controlled by a pull chain. 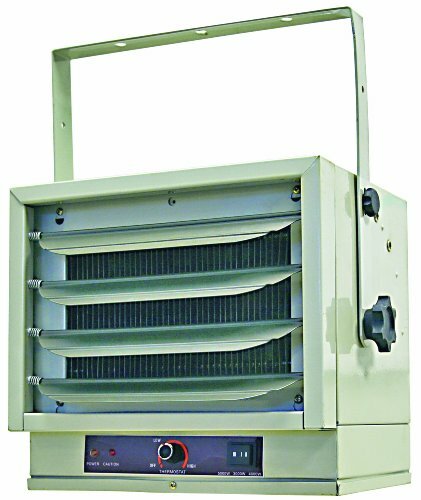 It has 2500 cfm of airflow and rust-resistant grills. The speed control on this fan is easy to use. This fan is adjustable to focus the airflow where required. This fan is engineered not to rust making it durable for the garage. This garage fan is a great model for those looking to save space as it can be installed overhead. These fans are extremely loud. It needs to be installed securely otherwise it poses the risk of falling. ​It must be installed properly, but once in place, provides a powerful tool for cooling garages. Although loud, you can focus it on certain areas. It has three speeds. A wall mounted garage fan, this model is engineered to perform quietly. It has 16-inch blades and can oscillate. It has thermal overload protection and can be controlled by remote. There are three speeds and will shut off if assembled incorrectly. The remote makes this fan convenient to operate. There are three speeds for better temperature control. The fan can oscillate to circulate cold air or can be focused in one spot. The thermal overload protection and shut-off for incorrect assembly are great safety features. Some users have complained that it leaks a little oil. This garage fan needs to be mounted on a wall making it a little more complex to install. ​This model is a good fan for indoors or for the garage. It oscillates at three powerful speeds but needs to be installed on a wall. Dual purpose, this unit can be used both as a fan and a heater. It has a removable grill for easier cleaning and is installed overhead. It has a safety shut-off for overheating and an adjustable thermostat. It is mounted overhead which saves space. It can be easily cleaned by removing the front grid. The thermostat makes it easy to control the temperature. A great choice for those with warm summers and cold winters. This model is made from industrial grade materials for super durability. It rattles a little if not installed perfectly. It is too much for someone needing only a fan. It is a good dual-action tool if you have cold winters and hot summers. Both a heater and a fan for the garage, it does rattle a little so make sure to install it securely. If you need to cool down your garage, installing a garage fan will help the air flow. Consider the size space you have, and pick the required power level. Oscillation features are great for air circulation. Consider wall-mounting as it will help save you space. Don’t forget to think about where you will plug in your fan and consider the length of the cord.